I’ve always been a sucker for military sci-fi. A few years ago someone gave me a copy of John Scalzi’s book, OLD MAN’S WAR and I devoured it. Scalzi envisiones a future wherein man has reached the stars and found them populated by some truly hostile aliens Defending human colonists are the Colonial Defense Forces, made up of enhanced soldiers recruited from the ranks of the earth’s senior citizens population. Seniors are given the chance to have their consciousness transferred into new, stronger bodies genetically altered for peak performance. Their blood is made up of nano-bots for quick healing and each CDF soldier is implanted with a pea sized computer directly into their brain. These Brain-Pals aid the newly awaken warrior cope with his new form and the savage wars he or she is about to participate in. Towards the end of that first book, we learned that even among CDF troops there existed an even tougher branch known as Special Forces. Many of the seniors who signed on to participate in the CDF actually died before they could be fully intergrated into their new bodies. From these deceased volunteers, the CDF had taken DNA samples. From these DNA samples they proceed to clone new, more advanced bodies. Unlike the CDF recruits who had their personal psyches transferred to their new host bodies, clone warriors are born without any past identities. During the cloning process, Special Forces are genetically engineered to be the most loyal, professional soldiers ever imagined. Yet they must evolve new personalities. Realborns call them the Ghost Brigades. In this adventure, second of a trilogy, the CDF finds itself dealing with a traitorous scientist named Charles Boutin, an expert in consciousness mapping and Brain-Pals. For his own unfathomable reasons, Boutin flees his labs and seeks political asylum with an enemy alien race. Afraid of what Boutin might give this race, CDF generals are frantic to discover the meaning of his defection and how much secret data he escaped with. When it is discovered Boutin left behind a copy of his own consciousness, a daring plan is devised to imprint that very consciousness onto a newly hatched Ghost Brigade clone. Of course it is a double-edged sword. Will the clone really be able to access the scientists store of knowledge and solve their puzzle or will he evolve into a second traitor and betray them? Once Jared Dirac is brought to life, the book kicks into high gear as we follow the newborn’s entry into the Special Forces excellerated training program. By the use of their hyper-fast Brain-Pals, Dirac and his team can communicate instantaneously, transferring huge amounts of data in micro-seconds. Jared is just a regular member of the squad until the day, after returning from a particularly harrowing mission, he suddenly has flashes of Charles Boutin’s memories. These are so vivid as to detail the traitor’s current whereabouts. Once Jared tells his superiors, a mission to retrieve Boutin is quickly conceived. Dirac will be a part of a Special Forces unit sent deep into enemy space to retrieve the turncoat scientist. Scalzi never lets up on the suspense and action. His story is both exciting and stimulating as his delves into themes of personal identity in regards to manufactured people with only copies of consciousness. Do they possess souls apart from their originating DNA codes, or do such things as soul truly exist? What really makes up the mind? All of these ideas are brilliantly interwoven through this grand, all-out action saga. 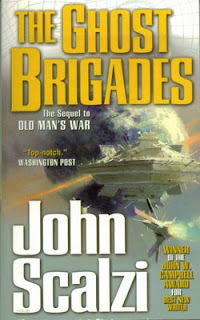 THE GHOST BRIGADES is one of the finest science fiction books I’ve ever enjoyed. Now it’s time to go find that third and final chapter of this truly fantastic series. Those of you familiar with this column will be aware that I’ve already reviewed the first half of this book. This strange chain of events came about when I’d purchased the paperback edition which contained only the first half, sub-titled Judgment of the Witch. At the time I bought the book, I was unaware it was incomplete. Again, I don’t want to retread old ground here as in that initial review I made my displeasure very clear to one and all. Here was a book I enjoyed immensely and was now forced to seek out its second half. Several attempts to order on-line proved fruitless and I invariably resorted to visiting a local Barnes & Noble to order part two; Evil Unveiled. As it would turn out, the store clerk screwed up my request and put in a order for the trade paperback version which contained the entire novel! And they let me have it for the price of the smaller paperback. Amazing. So I came home with this volume and promptly took the incomplete paperback and threw it in the trash. Again, a pox on the publisher for releasing such a great read in so ridiculous a fashion. That said, the remaining half of the book is just as powerful and the first. Young legal clerk Matthew Corbett is frantic to save innocent Rachel Howarth from being burned at the stake for witchcraft. Convinced there is a criminal mastermind plotting to destroy this new colony town, Matthew gambles everything, including his own future, in a desperate gamble to save the woman and unmask the true villain. McMammon is one of the finest American writers working today. He breathes such life into this pre-American world of those struggling early colonists who daily wrestled a hostile, frontier environment to make a new world for themselves. His research is remarkable the cast of characters rich and captivating. 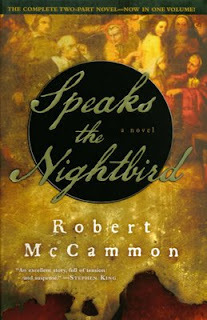 SPEAKS THE NIGHTBIRD is the first in a new series from this talented tale-spinner and you should not miss it. But please, once more. Make sure you buy the complete novel and don’t go through the hell this reviewer traveled to finish it. 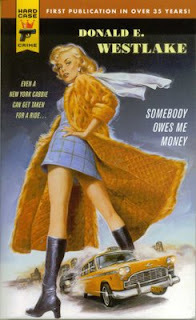 Veteran crime writer Donald E. Westlake can write gripping, tough stories with the best of them. Hell, he is one of the best of “them.” But then again he can whip up a dandy mystery, infuse it with his own unique brand of humor and have you laughing out loud in no time flat. Such is the case with this comedy about a New York City hack named Chet (he despises Chester) Conway who, in one turn of destiny’s wheel, goes from being a lucky gambler whose horse came in to a desperate murder suspect hunted down by two very dangerous criminal gangs. Chet’s long shot nag wins him close to a thousand dollars. A nice pay-offs for a fellow use to winning and losing tens and twenties. Believing his ship has finally come in, he arrives at his bookie’s apartment only to discover the guy has been shot to death and his money swiped. Chet does the right thing and cooperates with the police but that doesn’t stop two rival mobs from believing he’s somehow involved and is now a liability to their organization. Enter the dead man’s sister, a lovely, vengeance obsessed blonde named Abbie, (she despises Abigail) and suddenly Chet is not only scrambling for his life, but now he’s teamed up with a tough-as-nails beauty with a habit of attracting trouble. By the time a bullet creases his skull, sparing his life by inches, our hero starts to wish he’d never made that bet in the first place. Caught in the middle between the gangs and the cops, with an unknown killer after him, our stalwart cabbie must become the hero and solve the murder or become the next dead body. The laughs come as fast as the bullets in this gem of a mystery and the poker-game climax had me marveling at the cleverness of Westlake’s plot. This is just plain mayhem fun from a master story teller. Give yourself a treat and pick it up. 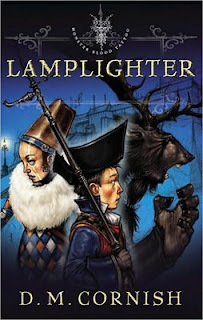 Last year I had the tremendous joy of discovering the world of Rossamund Bookchild, the orphan raised in a foundling home and at a young age sent out into a remarkable, alien world to seek his fortune as a royal lamplighter. Now if none of this makes any sense to you, it's because D.M. Cornish has invented an entire world to set his story in and it is a world like none you've ever encountered before. The last time I enjoyed such a rich, complicated literary fabrication was J.K. Rawling's world of boy wizard Harry Potter. There's a lot of similarities between Potter and Bookchild. There's also a huge dose of Charles Dickens and lots and lots of J.R.R. Tolkien. Cornish has woven a unique world so rich in details that it completely swallows the reader with it's multiple layers of social, economic and political history. But the most important thing you need to know about the lad's world is that it has monsters; of all manner and variety. In this second installment of what is to be a trilogy, young Rossamund arrives at the Lamplighter training hall to begin his training. Lamplighters are much like a national militia whose task it is to keep the empire's roadways well illuminated via a chain of lamppost that dot every single road in the empire, be they crowded municipal lanes or the off the map frontier paths. These brave men must keep the dark at bay, maintaining a tenuous grasp on civilization. Rossamund is proud to become one of them. Yet as the story unfolds, he is witness to repeated monster attacks, their frequency puzzling to his superiors. He also discovers political corruption among the fort's command and a dark, terrible secret hidden within its walls. Fortunately he is not alone in his adventures being aided by a truly unusual group of physcially altererd characters. There is Thrednody, the young girl with the mental psychic abilities to hurt monsters, Sebastipole, the human lie-detector and the beautiful Europe, who can shoot lightning from her hands and is a famous monster-killer. Like most readers, I'm always leery of long books by new writers. Having thoroughly enjoyed book one in this series, I was completely undadunted by this volume's 700 plus pages. I knew it would contain the maximum amount of adventure, thrills and wonder. I wasn't disappointed in the least. In fact, now that I've finished it, I can't wait for the final chapter and I hope it's even longer! You can never ever have too much of a good thing. There use to be a popular television commercial for hair growth products on television that I always got a big kick out. The sales dude identified himself as the president of the company and at the end of each segment, he'd hold up a before picture of himself bald as a cue ball and say, "I'm not only the Hair Club president, I'm also a client." Which is why the logo at the top of this column. You see, I am not only a reader and reviewer, I'm also a writer. But it would be inappropriate for me to ever review my own work here so I thought I'd merely announce the fact that they do exist and you might want to check them out. 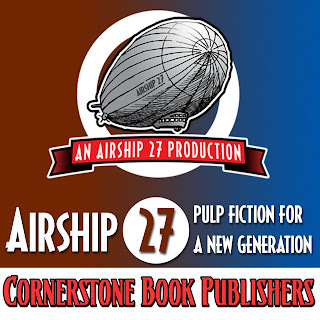 For the past few years, artist Rob Davis and I have produced pulp novels and anthologies under the Airship 27 Production banner. All our books are published via Cornerstone Book Publishers of New Orleans, Michael Poll publisher. And they are all available through all the major distributors world wide, to include Amazon, Barnes & Noble, etc. etc. We even have our own on-line store (http://stores.lulu.com/airship27). Please, stop on by and check out our titles. If you enjoy fast paced, action packed fiction, then I think we have something special for you. Thanks ever, Ron.